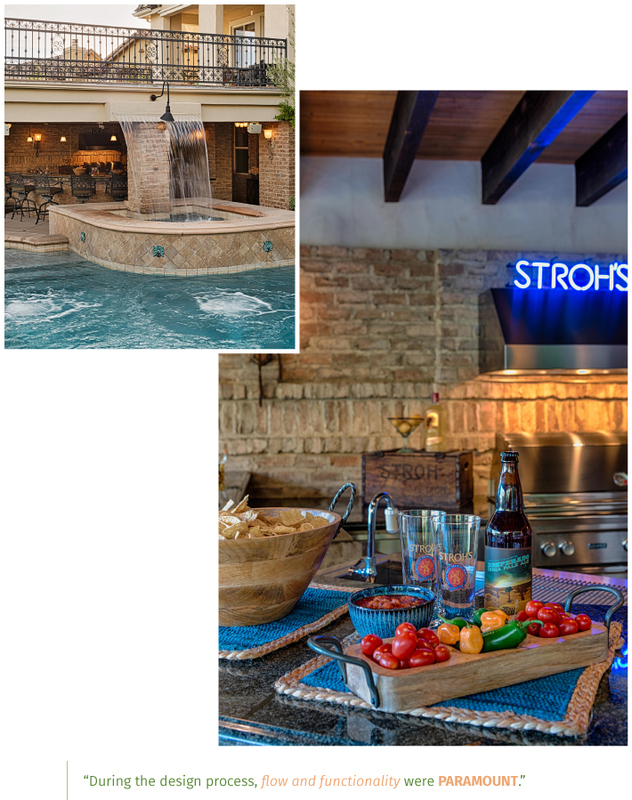 "Bringing the barbecue under the covered patio area created some challenges; we included a commercial hood and vent system to keep the bar area smoke free," says the pro, who worked on Brad Pitt's pool a few years earlier. Handmade bricks balance the cool, modern appliances and surfaces. 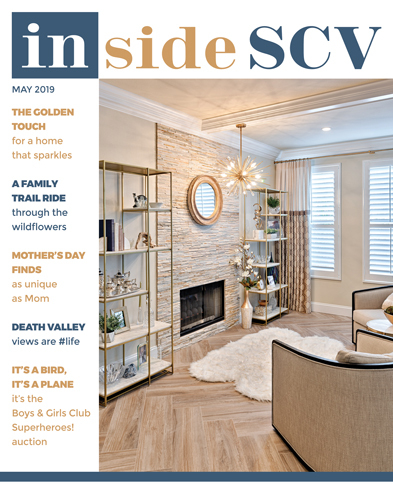 Jacque and Eric Stroh's Tesoro home is a study in beautiful contrast, fusing soft, organic details with modern elements of design and functionality. 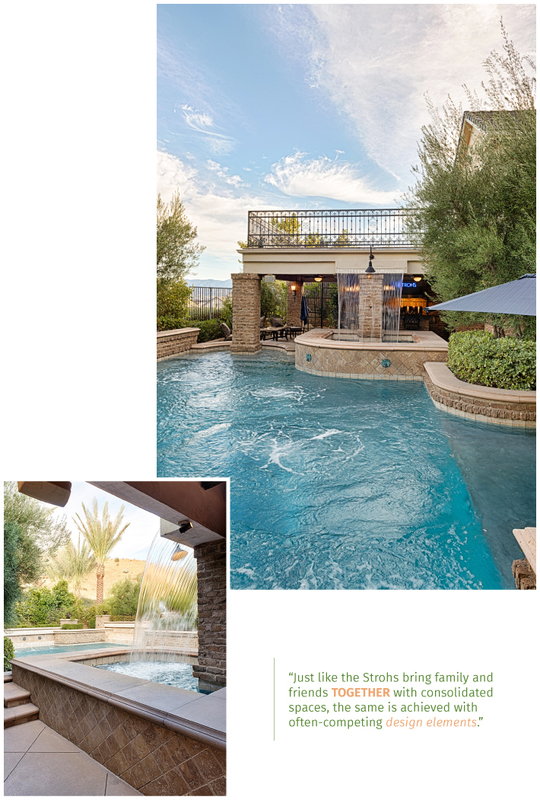 The outdoor space best displays this philosophy, combining elements like elegant water features with handmade brick, smooth granite and wood accents. 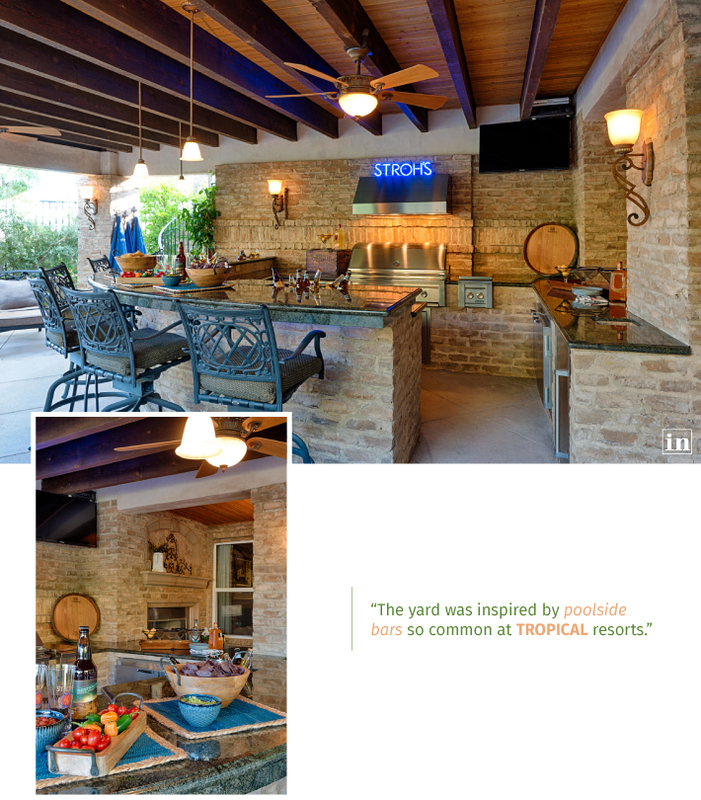 The yard was inspired by poolside bars so common at tropical resorts; prior to starting the project, the parents of two had recently returned from a Hawaiian vacation, where they spent plenty of time discussing layouts. Eric, who works in the construction industry, wanted to ensure that guests would feel included and welcome no matter where they were in the space. "I decided to go with a radius bar, since I wanted to be able to seat at least six. Putting six people in a row meant that the conversation would be segmented but with the radius design, everyone can participate in the same conversation," says the homeowner. Dark granite is the perfect foil for more-rustic and eclectic accents, like these pieces that proudly display the family name. The entire space has the same amount of thought put into it - and for the same reasons. "I didn't want a guest to feel like if they were at the bar, or watching TV, or in the spa, that they weren't part of the group conversation. The solution was to bring the spa, pool, bar and TV areas together. Even the pool has an area that enters the covered patio space, around one of the columns. The result is that everyone who is lounging, sitting at the bar, etc. can all communicate with each other or watch the game on TV," says Stroh. The pool has several unique water features; the spa doesn't overflow into the pool like most do. Instead, the water passes through hidden pipes and then flows into the pool from several medallions. "There are four columns of bubbles that arise from the deep area of the pool. At night, they light up. The kids love to swim through them!" says the homeowner. Just like the Strohs bring family and friends together with consolidated spaces, the same is achieved with often-competing design elements. "I really wanted to bring different materials together. The rough, handmade brick is set up under the sharp edges of the pre-cast cap in the pool area. Outside the pool, the brick is set against dark-granite counters and very-uniform concrete with sawcut joints. I didn't want everything 'too clean,' or 'too natural looking.' Setting one against the other shows off the uniqueness of both," says Stroh. Warm some water, enough to dissolve the sugar. Stir until well mixed. 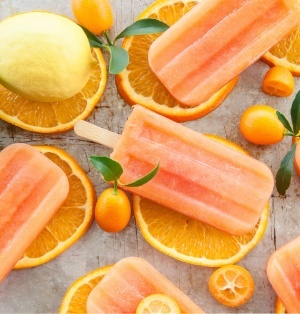 Add the juices, remaining water and stir; pour into ice-treat molds, remembering not to overfill. Freeze at least four hours, but ideally overnight, before serving. "If the spa or firepit was set apart from everything else, it would dissuade its use," says Stroh. "The solution was to bring all the areas together." 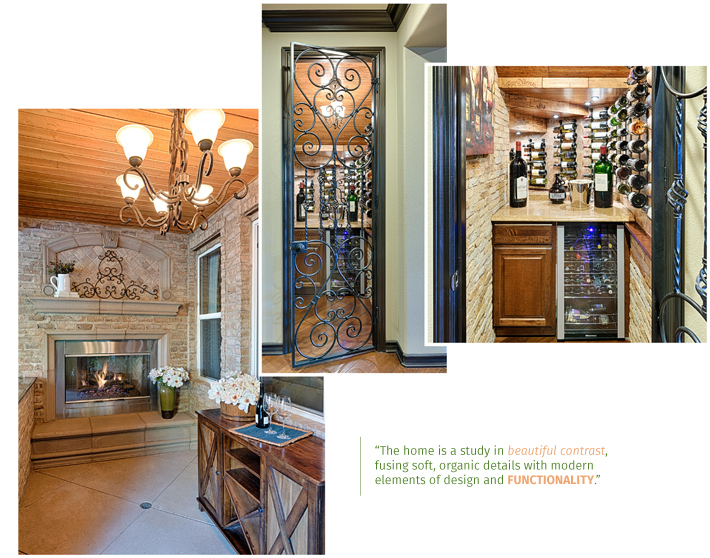 An open-lattice wrought-iron door welcomes guests into the home's well-appointed wine storage, conveniently located for fast access. Chilled beverages, favorite vintages and plenty of ambiance can be found in the home's wine storage space. During the design process, flow and functionality were paramount. "Knowing that I would most likely be the one manning the bar and the barbecue, I would need to have both in the same workspace. I also wanted a counter in the area that I could use to serve food without disturbing the guests at the bar. The result is my 'command and control' area that has everything at my fingertips: the bar, drink storage, barbecue, serving counter, under-counter fridge, TV controls, in-counter trash opening and more," explains Stroh.